100% Pure french lavender hand buttercream. 100% Pure is one of my favorite companies. They use really safe ingredients (like fruit to color their makeup! ), they’re cruelty-free, and have some really great environmental practices. They’re not 100% vegan, though most of their products are. I own this hand buttercream in another scent, and love how soft it makes my hands feel. This lavender scent is a clean, soft floral scent. I’ve been using it a lot especially because it is the perfect size to throw in my purse, and I’ve given it to J to use several times because he has really dry skin in the winter. Modern Minerals En Pointe eye shadow. This is the second modern minerals eye shadow that I’ve gotten in a Petit Vour box (and that’s a good thing). I use my other one (Vixen) quite often, and I was excited to see this when I lifted the lid of the box. What is even cooler is that the shade included (En Pointe) is a shade exclusive to Petit Vour. It is such a beautiful pink, and I’m sure I’ll be wearing it a ton. EVOLVh leave-in conditioner. EVOLVh products are sulfate-, paraben-, and gluten-free as well as vegan, and each product is always at least 90% organic. The month before I began my Petit Vour subscription, their shampoo and conditioner were featured in the box. I heard so many raves about it, and couldn’t wait to try this brand out. I was excited to see this in the box because I was almost out of my Yarok leave-in conditioner that I had received in another box. So far, so good. This is a solid product that my hair really loves! RawSkinCeuticals rose creme cheek color. RawSkinCeuticals creates chemical-free raw vegan skin products. 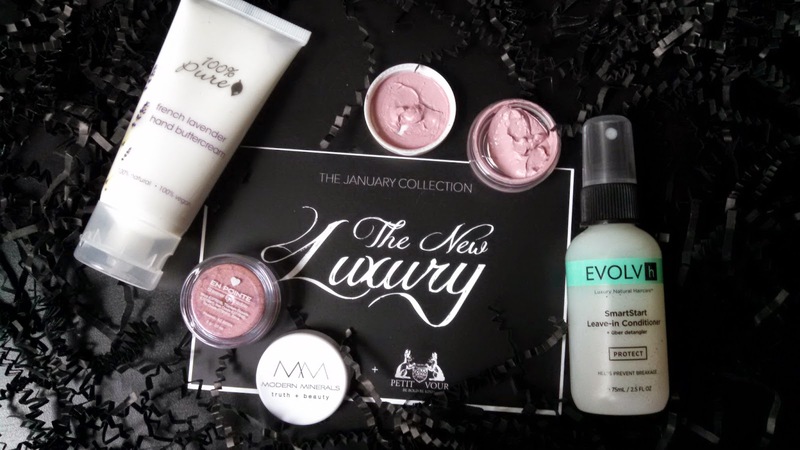 I loved perusing their site to see what kinds of products they have, and they offer skin care and makeup samplers which is so helpful. When I unscrewed the lid and saw a muted lilac color within, I was slightly hesitant to use it. The trick is to use a tiny, tiny bit. It adds just a hint of color and though it’s not my favorite blush, I do like it. I think it would look best on me with a very soft, natural makeup look, nothing too flashy. I think it pairs with En Pointe really well, too. I’ve just received my February box in the mail (boy, time flies), but I haven’t yet opened it. With this review wrapped up, I’m off to look at February’s treasures!